Hairdresser Eddie llic works in a busy city salon and looks forward to a day off during the week. But you won’t find him having a lie-in or playing computer games in his down time. 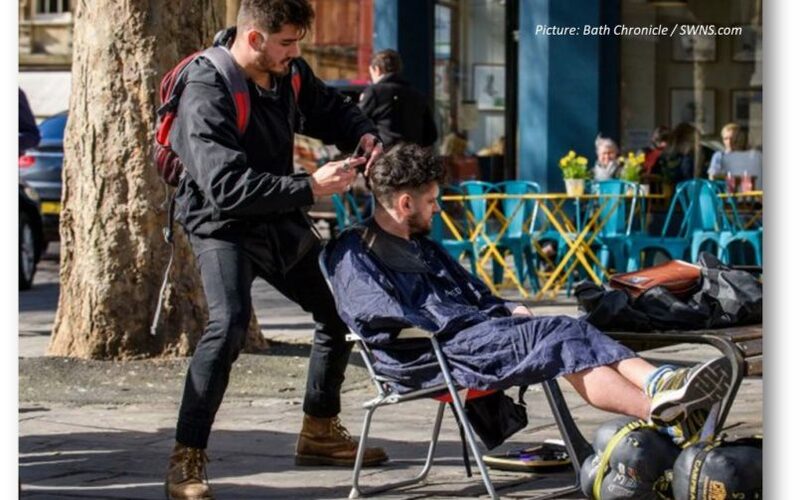 For that’s the day Eddie packs up his portable chair, checks his scissors are sharp and takes to the streets of Bath to provide free haircuts for the homeless. The people he helps, he says, are his medicine. A constant reminder of how very different his own life could have been. This 24-year-old knows only too well what it’s like to hit rock bottom. Three years ago he was spiralling out of control in a haze of drugs and alcohol. He had been in trouble with the police, stolen money from his parents and been suspended from his job as an apprentice at BA1 Hair in Bath because of his erratic behaviour and repeated disappearances. Eddie says he had been in and out of trouble generally since his school days where he was also suspended. He had started smoking weed when he was 14. “It’s just amazing how much it can change the way they think and feel. It makes me feel good to see that I can do one little thing and I see how that makes them feel about themselves,” says Eddie. But conscious of the fact that not everyone in need attends the centre, Eddie then takes to the streets of the city in the afternoon. “Sometimes people can be quite shy and don’t want their hair cut in public. I always offer to go somewhere out of the way if they want or I give them my number and arrange to meet them where they feel more comfortable,” he says.